Xcovery is focused on developing next generation tyrosine kinase inhibitors (TKIs) with increased potency and reduced toxicity. Xcovery has developed a portfolio of low toxicity kinase inhibitors, which may allow for combinations of different therapies to simultaneously address important hallmarks of cancer: metastasis – the spread of cancer cells to different parts of the body where new tumors are formed (our MET inhibitor X-379); and the development of mutations which cause resistance to therapy (our ALK inhibitor, ensartinib). The complexity of cancer cannot be treated effectively by targeting only one molecular feature. Several existing drugs provide modest patient benefit as monotherapy, however, due to the innate ability of cancer cells to adapt and develop resistance, the potential of these drugs is limited when used in isolation. Research indicates that combination therapies, which combine drugs with different mechanisms of action, impacting cancer cells in multiple ways, provide improved clinical benefit and decrease the risk of relapse. Unfortunately, many molecular cancer therapeutics currently approved by the FDA have overlapping toxicities and may be difficult to combine with other agents. Xcovery has focused on developing drugs with reduced toxicity that can be used in combination and therefore address the therapeutic challenge of intrinsic and acquired treatment resistance. The ALK inhibitor ensartinib has been validated in potency and selectivity assays indicating that it is more selective and up to 10 times more potent than competitive ALK inhibitors. Ensartinib has been active in animal models of non-small cell lung cancer (NSCLC) and neuroblastoma, a childhood cancer. Importantly, ensartinib has shown activity in models with ALK mutations that confer resistance to other small molecule ALK inhibitors. Anaplastic lymphoma kinase (ALK) was first identified as a chromosomal rearrangement in anaplastic large cell lymphoma (ALCL). Genetic studies now indicate that in addition to ALCL, abnormal expression of ALK is a key driver of certain types of NSCLC and neuroblastomas. Since ALK is generally not expressed in normal adult tissues, it represents an attractive target for molecularly targeted cancer therapy. 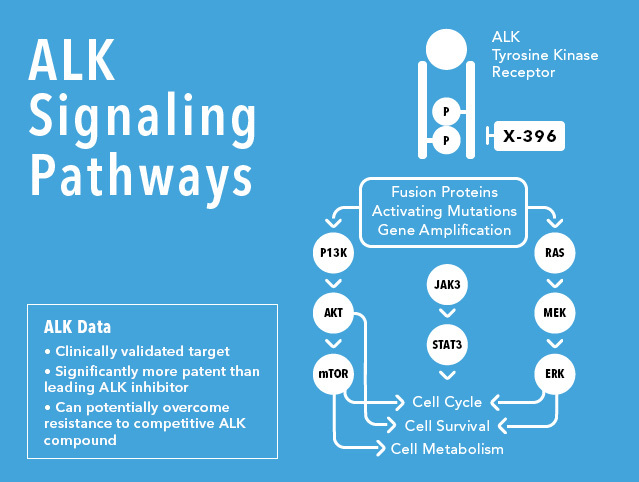 ALK is deregulated by multiple mechanisms including translocation to form a constitutively active fusion protein, activating mutations and gene amplification. The EML4-ALK fusion protein is found in a subpopulation of non- and light smokers that develop NSCLC. Multiple fusion proteins other than EML4-ALK have been identified in patients with ALCL. Similarly, multiple activating mutations in the kinase domain have been found in children with neuroblastoma. Ensartinib is currently in a global phase 3 trial in ALK positive non-small cell lung cancer (NSCLC) patients. The phase 1/2 clinical findings support the preclinical results that the use of ensartinib may result in favorable therapeutic outcomes in patients with ALK+ NSCLC, including patients with CNS metastases. In this study, ensartinib was generally well tolerated with the most common adverse event being a rash. Besides ALK, ensartinib also potently inhibits TRKA fusions, TRKC, ROS1, EphA2, and c-MET. Mauris lacinia porta faucibus. Fusce eu est ac eros vulputate mollis in ac felis. Aenean commodo scelerisque mi sed imperdiet. Donec at hendrerit nisi, eget vestibulum nisi. Sed sit amet magna luctus, facilisis erat quis, sagittis ligula. Aenean dignissim velit quis leo consequat ultricies. Proin quis pretium justo. Vestibulum at eros nisl. Fusce lobortis erat ante, eu cursus sapien molestie at. Pellentesque placerat ante diam, et euismod lacus dictum vel. Phasellus vitae sollicitudin mi. In pulvinar eleifend convallis. Suspendisse elit erat, venenatis eget ullamcorper ut, laoreet iaculis nisl. Sed porta, felis id rhoncus aliquet, quam ipsum pellentesque metus, in sodales quam nunc vitae risus. Quisque in venenatis massa. Phasellus neque risus, ornare quis nisl ultricies, ullamcorper consectetur orci. Suspendisse rhoncus orci odio, id faucibus ipsum tincidunt nec. Ut eget ante sit amet justo volutpat convallis vitae et augue. Phasellus sagittis cursus fermentum. Mauris lacinia porta faucibus. Fusce eu est ac eros vulputate mollis in ac felis. Aenean commodo scelerisque mi sed imperdiet. Donec at hendrerit nisi, eget vestibulum nisi. Sed sit amet magna luctus, facilisis erat quis, sagittis ligula. Aenean dignissim velit quis leo consequat ultricies. Proin quis pretium justo. Vestibulum at eros nisl. Fusce lobortis erat ante, eu cursus sapien molestie at. Pellentesque placerat ante diam, et euismod lacus dictum vel. Phasellus vitae sollicitudin mi. In pulvinar eleifend convallis. Suspendisse elit erat, venenatis eget ullamcorper ut, laoreet iaculis nisl. Sed porta, felis id rhoncus aliquet, quam ipsum pellentesque metus, in sodales quam nunc vitae risus. Quisque in venenatis massa. Phasellus neque risus, ornare quis nisl ultricies, ullamcorper consectetur orci. Suspendisse rhoncus orci odio, id faucibus ipsum tincidunt nec. Ut eget ante sit amet justo volutpat convallis vitae et augue. Phasellus sagittis cursus fermentum. The eXalt3 phase 3 study is being conducted globally and is currently enrolling patients diagnosed with stage IIIb or IV non-small cell lung cancer identified as ALK positive. The study will compare Xcovery’s study drug ensartinib to commercially available crizotinib (Xalkori) on patients who have never been treated with a class of drugs known as ALK tyrosine kinase inhibitors (TKI’s). The objective of this study is to compare the effectiveness of both drugs on eligible patients. Patients will be randomly selected to one of the two available treatment options for this study. The study drug will be provided along with a scheduled treatment plan involving clinic visits. The eXalt2 phase 2 study is being conducted at various locations across the United States. This study is currently enrolling patients with stage III or IV non-small cell lung cancer identified as ALK positive that have progressed on crizotinib and/or alectinib. The study drug will be provided along with a scheduled treatment plan involving clinic visits. eXalt3 is a phase 3 study designed to compare the effectiveness of our study drug ensartinib with crizotinib (Xalkori) which is the current available medication to treat ALK+ non-small cell lung cancer (NSCLC). All patients that were enrolled in the eXalt3 study were randomly assigned to one of these two treatments. Participants will be followed closely by their oncologist to monitor the safety and effectiveness of the medications. Phase 1/2 study evaluating ensartinib as a potential treatment for patients with ALK-positive Non-Small Cell Lung Cancer (NSCLC) who have previously received treatment for the disease. eXalt2 is a phase 2 study of ensartinib in patients with ALK+ lung cancer, and is currently evaluating the safety and efficacy of ensartinib in all study participants. NCI_COG Pediatric MATCH (Molecular Analysis for Therapy Choice) study: Phase 2 Subprotocol of Ensartinib in Patients with Tumors Harboring ALK or ROS1 Genomic Alterations. The COG through the NCI is conducting a phase 2 trial of ensartinib in children with recurrent or refractory solid tumors (including lymphomas, histiocytoses and CNS involvement) harboring specified activating genetic alterations in ALK or ROS1 pathway genes. The eXalt3 phase 3 study is being conducted globally and is currently enrolling patients diagnosed with stage IIIb or IV non-small cell lung cancer identified as ALK positive. The study will compare Xcovery’s study drug ensartinib to commercially available crizotinib (Xalkori) on patients who have never been treated with a class of drugs known as ALK tyrosine kinase inhibitors (TKI’s). The objective of this study is to compare the effectiveness of both drugs on eligible patients. Patients were randomly selected to one of the two available treatment options for this study. The study drug will be provided along with a scheduled treatment plan involving clinic visits. The eXalt2 phase 2 study is being conducted at various locations across the United States. This study is currently enrolling patients with stage III or IV non-small cell lung cancer identified as ALK positive. The study drug will be provided along with a scheduled treatment plan involving clinic visits. The nation’s leading agency for cancer research, providing information for patients and healthcare providers. This foundation is devoted exclusively to eradicating lung cancer through a variety of outlets. Free to Breathe is an organization whose goal is to double the lung cancer survival rate by 2022. The organization focuses on funding research, increasing the number of lung cancer patients participating in clinical studies, as well as building the lung cancer community. Inspire allows individuals to start and participate in discussions related to various medical topics. Inspire has various communities for those affected by lung cancer to join and interact with fellow patients, caregivers, and survivors. This organization’s aim is to triple the number of lung cancer survivors over the next decade through research, access to quality care, and framing the conversation. Moreover, this organization provides education and treatment options to lung cancer patients. Lung Cancer Foundation of America raises funds to increase support of innovative and groundbreaking research efforts in lung cancer. LungCancer.org is a source of education materials on lung cancer, as well as support opportunities for patients. Lungevity is a lung cancer-focused nonprofit organization that aims to change outcomes for people with lung cancer through research, education, and support. The foundation raises money to support research and individuals whose lives have been changed by lung cancer. ClinicalTrials.gov is a registry and database of clinical studies of human participants conducted around the world. Xcovery is participating in the NCI Formulary, a public-private partnership between the National Cancer Institute (NCI), part of the National Institutes of Health (NIH), and pharmaceutical and biotechnology companies to expedite the use of agents in clinical trials. The partnership seeks to alleviate the lengthy process to develop new therapies for patients, and respond to the call for greater collaboration within the industry made by Vice President Joe Biden’s Cancer Moonshot Initiative. Research indicates that combination therapies, which include drugs with different mechanisms of action impacting cancer cells in multiple ways, provide an improved clinical benefit and can decrease the risk of relapse. The establishment of the NCI Formulary will enable the NCI to facilitate and streamline the arrangements for access to and use of pharmaceutical agents from multiple organizations, allowing for further research on various therapeutic opportunities. Following Xcovery’s approval, investigators will be able to obtain and test ensartinib in new preclinical or clinical studies, including combination studies with formulary agents from different companies. Xcovery is open to working with investigators who are seeking expanded access treatment for their patient(s). Eligible centers include those that currently have investigators conducting ensartinib related trials in the United States. A list of the investigators can be found on the Clinicaltrials.gov website (www.clinicaltrials.gov and search ensartinib or X-396). Inquiries on expanded access treatment should first be consulted with your oncologist. Please contact clinicaltrials@xcovery.com for additional information.